At a recent event I tried to use an on-camera speedlight (SB-800) as a master and a off-camera speedlight (again SB-800) in a CLS setup where I would hopefully use the off-camera flash as a silhouette light. Although I’d tested them before getting into position (so channels and groups were fine) – the remote flash just didn’t fire. It was relatively in line of sight so that shouldn’t have been the issue, however with the speedlight facing forward the detector would be at the side of the speedlight and it was behind a shoot-through umbrella. I now think that possibly the combination of these meant that the signal from the master speedlight wasn’t getting through to the remote. It was also in a party environment so there were other lights which may have caused issues. Turning the shoot-through umbrella to a bounce one may have worked (it’s a convertible umbrella), but there wouldn’t have been time for that. Taking the umbrella off may have also helped, I should have tried this but alas didn’t. In the past I’ve used a remote flash like this but using a radio trigger rather than Nikon CLS system. I didn’t go for this setup on this occasion as I needed a on-camera speedlight as it was too dark without it. So alas I made do without the remote speedlight. After the event I investigated the option of using an on-camera speedlight but also a radio-triggered remote and my results are below. The initial issue is that cameras only have one hotshoe. The on-camera Speedlight obviously needs to go in this. However most radio-triggers are also designed to go in this. They both can’t. Thankfully there are a set of other connectors available. 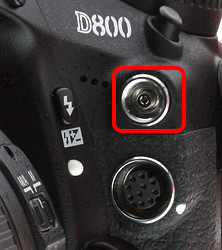 PC socket: The PC socket is the standard/traditional method of firing flash via a cable. Usually you’d use the PC sync on the speedlight to fire the speedlight itself i.e. incoming signal. However it appears that this socket is by-directional. 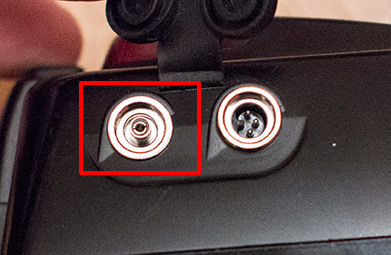 The Sync connector on the Speedlight is smaller than the usual jack – it’s a 2.5mm jack socket rather than 3.5. 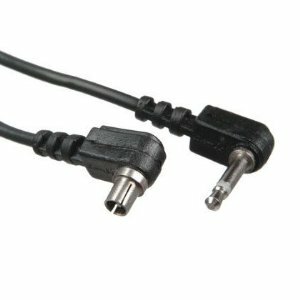 So the cable needs to be a 2.5mm jack to PC sync connector. Thankfully one of these is supplied with skyport transmitters. I hadn’t taken it out of the wrapper let alone out of the box so I wasn’t really aware of it until investigating this issue. I wasn’t sure if it would work correctly and wasn’t sure which PC sync to use – the camera or the speedlight. My thoughts were that if the on-camera speedlight was in TTL that there may be a flash sync speed issue, particularly with the TTL pre-flashes. So I tried both. Standard settings – both worked. Pushing shutter speed up to 1/250th – both worked! Remote Speedlight: Set to manual power, skyport receiver plugged in to the PC sync port. On-camera Speedlight: Set to TTL, mounted on camera hotshoe. 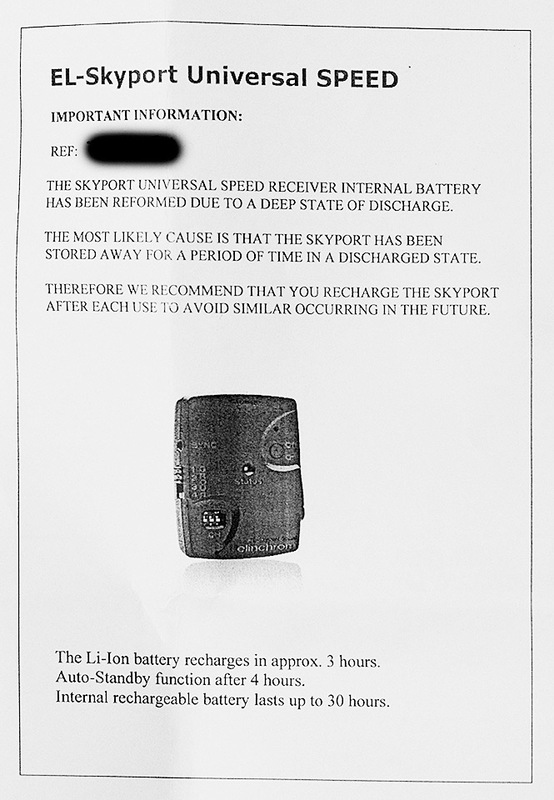 Skyport Trigger: Connected by above cable, to PC sync port of either camera or on-camera speedlight. So in future I may try this in such scenarios. It’s handy to know that it’s possible to mix TTL/CLS and manual radio triggering. Worth noting of course – since operated by a standard “GO” signal radio trigger- you can’t control the power from the camera. Pocket wizard have made TTL capable radio triggers (FlexTT5/MiniTT1 for firing and AC3 controller for varying power) but they’re considerably more expensive that simpler radio triggers that just send a “go” command. Not wanting the skyport trigger dangling by a cable which can come out I considered mounting the trigger to the speedlight via something like velcro or elastic. 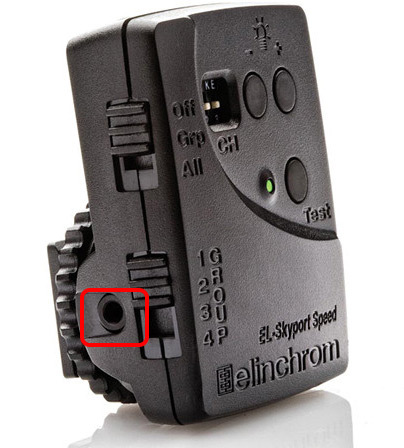 In testing this I found that if you place the trigger flat against the speedlight – trigger: the flat side with buttons, speedlight: on top of the flash head – that the signal would not get to the receiver. I imagine this is due to interference from the pulse of the speedlight firing. Instead I think I’ll attach the trigger to the side of the speedlight with elastic. 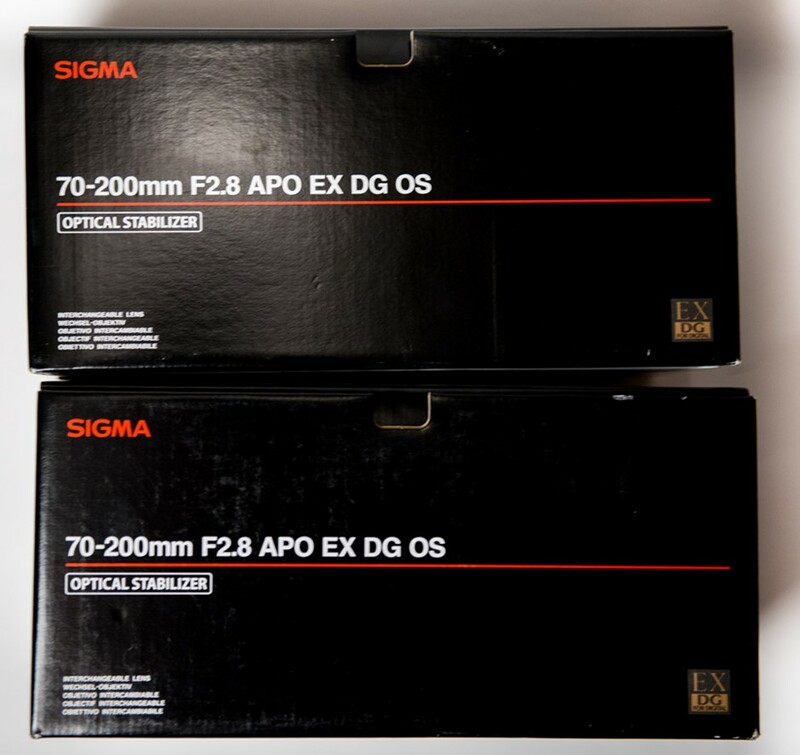 Am selling a few of my previous boss’ old photography equipment – including Canon film SLRs. Started with bits that didn’t need a clean including a Minolta IV F Auto meter – a light meter. When photographing it I thought I’d give it a quick test and found out that it was way off! My light meter was giving f8 (1/250 ISO 100) while the Minolta gave f22! There is a little dial to adjust within the battery compartment – but this didn’t give enough variation to reach f8. I did a few searches to find out how much it would cost to calibrate it when I came across this video. It sounds strange – but it actually works! I first tried it with a piece of card and didn’t run – and it didn’t work. Then tried an actual US dollar bill (I happened to have one) and did the rubbing thing – and it worked! Is so strange – can’t imagine this is a true calibration – at best guess it either cleans the contacts or somehow removes a charge in the system. Not sure how a dollar bill/rubbing would have changed things. But it’s so strange – thought I’d post it. Here’s the lightmeter on eBay if you fancy one. Auction ends 29th April. 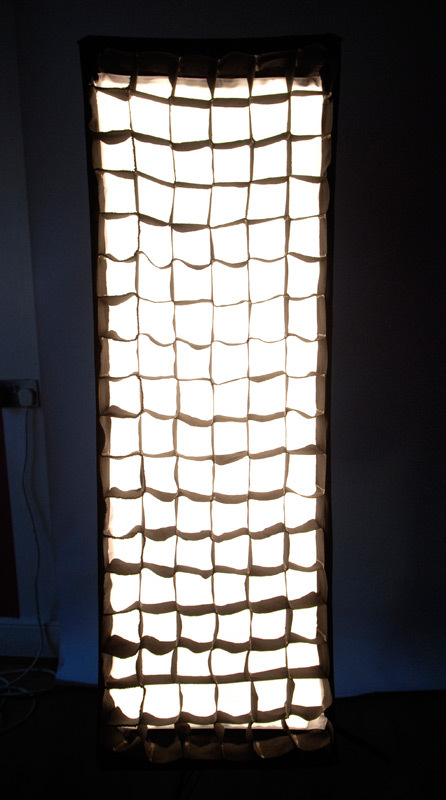 I have a couple of long + tall softboxes, what I guess you could call strip softboxes. A cheap one that keeps breaking but came with lots of additions such as a grid/egg-crate and a nice one from Interfit (SLBR412 – 120cm x 40cm) that didn’t. I initially bought the big Interfit strip to use as a main light – for even whole body lighting – but on occasion and more recently I’ve been using it as a rim-light. However due to it’s size (particularly 40cm width) the spill from it is quite significant. So I started looking for a grid for it. The task was not very easy. I even e-mailed Interfit and they couldn’t suggest anything. Having looked around I seem to remember (it was a while ago now) finding a custom maker that would make it for about £150 from the states – more than the cost of the actual softbox! (about £100). 120×40 cm was a tricky size too as other manufacturer strips seem to be about 120×30 cm. I found a few online examples of making DIY softbox grids and took some inspiration from those (See References below). Since I had a pre-existing one I thought I might as well replicate that ones as it seems to work fairly well. Material wise – it was made out of some form of thin but stiff material/webbing. Since I have no idea about material really, or more so about something unusual like this I just went into a haberdashers and asked what they had was black and fairly stiff. Just happens I was in John Lewis looking for something else (think blackout material) so asked them. They directed me towards “Bolton Twill” saying that another photographer had used some recently! In fact they’d taken almost the last of it so I had to order in. Bit foolish of me really as I hadn’t done any measurements at that point. Dimensions wise I kept with the existing squares dimensions 6.5cm x 6.5cm and also the same depth – approx 4cm as this softbox has an extending edge from the diffuser panel – as per the cheap one. I followed the design pattern used by Adriel Henderson give or take a few minor changes. I cut a couple of lengths that were long enough for a side and and a top/bottom – so 120cm + 40cm = 160cm, which would server as the outside edge. For the boxes followed this plan (see diagram). This is the view as seen if looking directly at the softbox. 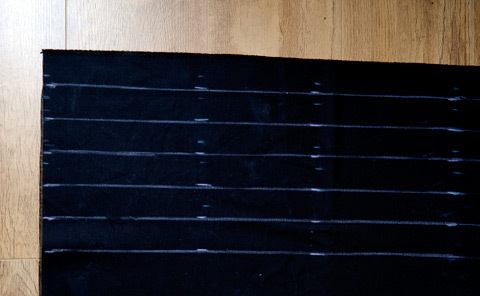 These strips of fabric would also be approx 4cm deep. The Red areas = As per Adriel’s design – there is a bit of doubling up where a length of the strip will cover an existing portion of fabric. It would mean marking out and cutting a fair few more strips. I had enough fabric to not worry about this doubling. The layout would be something like this, I hope you can understand the colours. Rather than going down in squares, the strips go diagonally down in zig-zags. I designed the layout in Excel and added the numbers for the lengths so that I could easily sum the columns and get the lengths of the strips I needed to mark out and cut. Chalk to mark out lines – already had. So in all a cost of roughly £39 for the materials that went into it and additional £11 for the scissors and sewing machine which I will use again. I have a fair amount of the fabric left so could try to make something else like spill-kills. Of course – it cost a fair bit of my time – but having a bit of spare time at long last and ability to do this while at home watching TV/a film – it really isn’t too bad. Initially I was only going to glue the fabric together but I saw mention of a hand sewing machine somewhere and thought, what the heck. I’m glad I did – although this sewing machine had it’s faults – sewn joins are probably a lot firmer than glued. I had considered buying a mini proper sewing machine – you can get them for £20-40 but rejected it as it would take up space later, and I thought the above would be more suitable as I could sew up into the grid holes, while a larger machine would have issue with sewing parts already stuck to existing small holes – the holes wouldn’t be able to fit…. but I was mistaken – more on that later. Although 6.5cm squares don’t fit into 120cm evenly – I thought I should round up to the whole square as it’s not a bad thing having a grid slightly too large – better than one that’s too small. One definate tip is while you mark out the strips of fabric – also mark out the markers for where you will join them together – so every 6.5 cm for me. This makes it a lot easier to mark them at the same time – no need for duplicating work – and means you’re sure your glueing/sewing the right place.Thought I had a picture of this – obviously not. Initially I was going to glue the strips in place but glad I went with sewing as it was sturdier. I thought that the little hand sewing machine would be able to sew into the squares as I consructed them – but turns out it has one of those fabric advancing feet as standard sewing machines and it moved across – so I had to sew sideways into the squares. I would initially sew the squares together – but as the little machine would miss some stitches I’d sew one way and then another – I could turn the machine around with some wrestling. Shame I didn’t take more photos explaining the production really… but I guess the layout is fairly basic. After finishing the grid I trimmed off the fraying edges and put a little spot of glue at all the intersections to try to stop any more fraying. My existing grid uses stitched on velcro (hook side) to attach to the rim of the softbox which is lined with the opposite hoop side velcro. 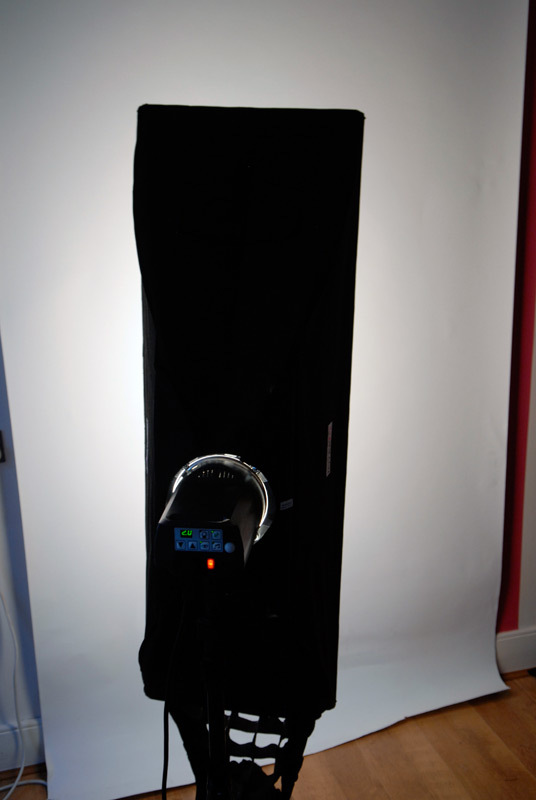 As my large softbox has this too – I thought migt as well do something similar. Rather than sew-on (I don’t think the littlsewing machine could cope with it) I’ve gone for srick-on. Velcro strip usually start from about 20mm but I thought I’d go for slightly wider 25mm to give more support and even out the weight. Here’s a view from what I’d roughly say was 45 degrees. The exposure was as the above two shots – no post done to the levels etc. You can see there’s more light bleed coming from the first column of cells. InitiallyI wasn’t sure why this was – although not exact – my cells were of roughly similar sizes. 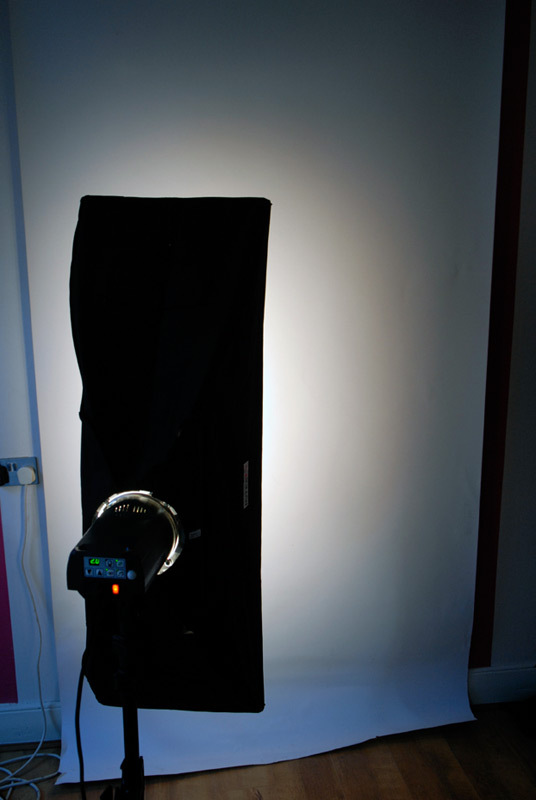 But I think I’ve figured it out – because the softbox is a wedge shaped – i.e. narrow at the back where the light is, and wide at the front – the side of the softbox the grid is attaching to isn’t perpendicular if looking head on of course – it’s flared. And so the first column/row on both sides and top/bottom will be wider and have a slanted edge. 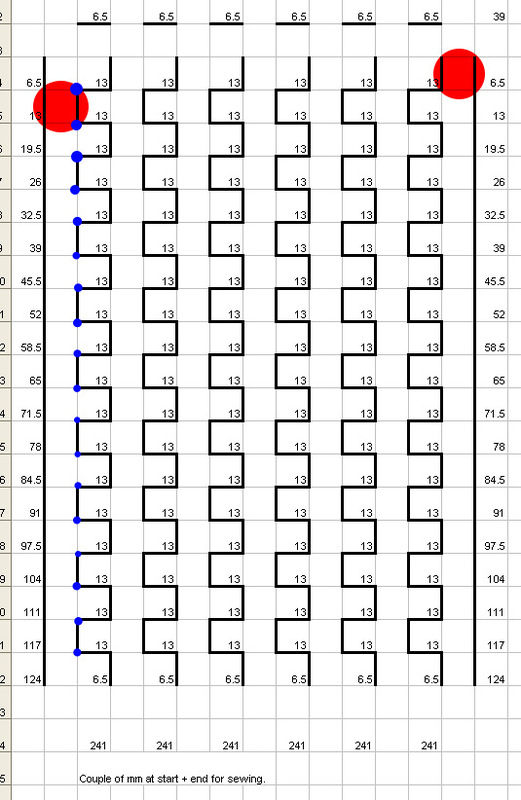 There are a few things I would have done to improve the grid…. Although it does a good job – I think I could have looked around a bit more – that of the existing grid is softer and lighter. I was initially tempted to buy a mini-big sewing machine – but rejected it thinking it wouldn’t be able to sew the squares together as they are only 6.5cm square, and the base of the machine would not fit through there. I also thought the little machine would would sew into the squares, making it easy, but due to the fabric advancing feet I had to sew sideways into the squares. To do this I flattened the edges of the squares and this made me realise I could have just dones this with a standard machine! The little sewing machine was also rather temperamental about making stiches – sometimes the back hook wouldn’t catch – so I doubled up. 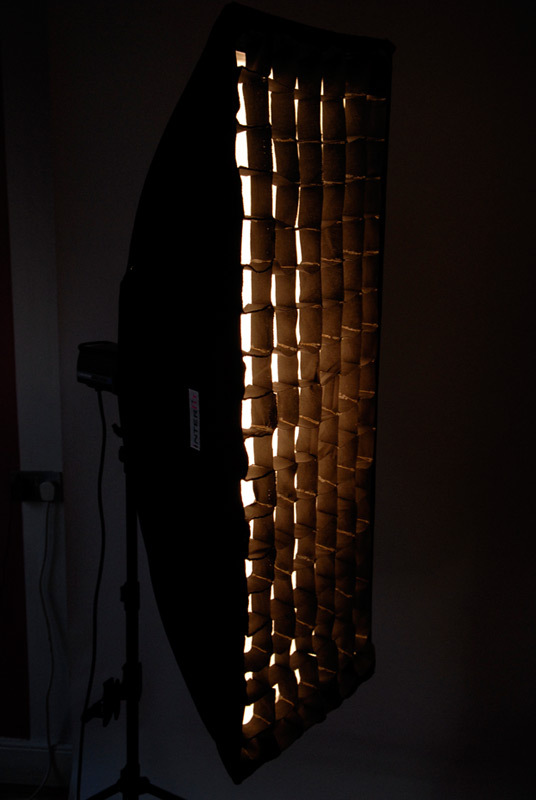 The velcro attaching the grid to the softbox does come away a little – even though the stick does seem very firm. Looks like I’ll need to sew it a little. Maybe just at regular points rather than al along. Although it does the job – in reality I would prefer that the grid restrict the light more – especially at the edges where I discovered an issue. To do this I would have needed to do one of two things – either make the grid deeper (unlikely as there was no more space to velcro it in and the fabric isn’t THAT firm) or make the squares smaller. Of course making the squares smaller would mean more sewing and more strips. 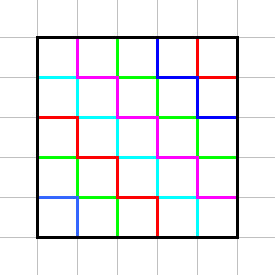 While looking up the references to write this blog I came across an old DPreview forum thread I’d started when looking for a grid last year. I’d forgotten someone had linked to a page detailing technical measurements/sizing for grid cells for the angle of light. A 30 or 20 degree grid would have been great, but with 2-3cm squares that would have meant double the amount of sewing. 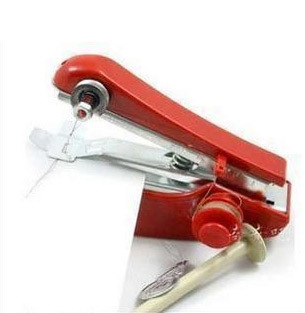 With this little machine – not a task I’d fancy. Although I don’t really do retouching* on the majority of my photography, such as events, I have got into it with studio shoots – be it portraits or product shots. A higher standard of image is expected so will go into this level of detail. 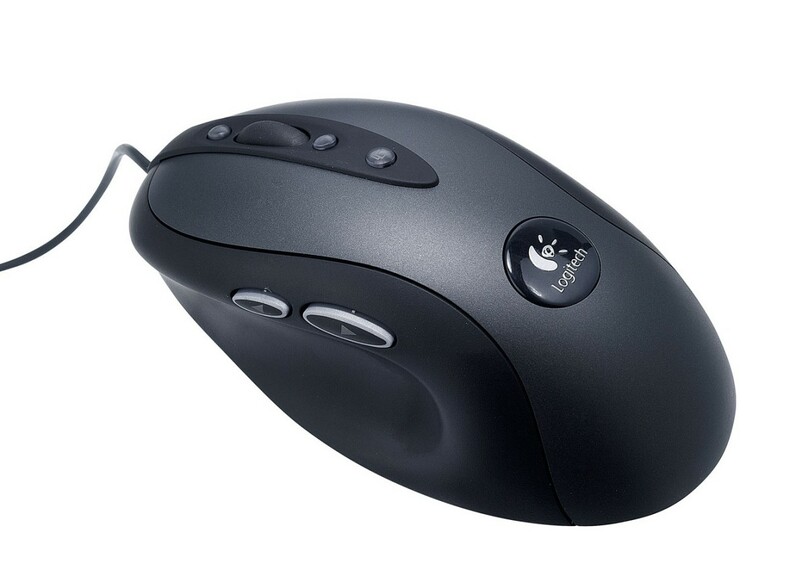 When doing this I have on occasion felt that using the mouse hasn’t been the best option and so for a while I’ve thought about trying out a pen tablet. THE name in these is Wacom. They have all kinds of pen tablets from small “fun” tablets up to screen displays that will work as direct editing tools. Being the cheapskate that I am I’ve only been really considering their small fun range – the “Bamboo” range. Also – the main selling point at the show – they were packaging them with a free wireless kit (usual price £35). This weekend was mostly spent learning the ins and outs of using it. 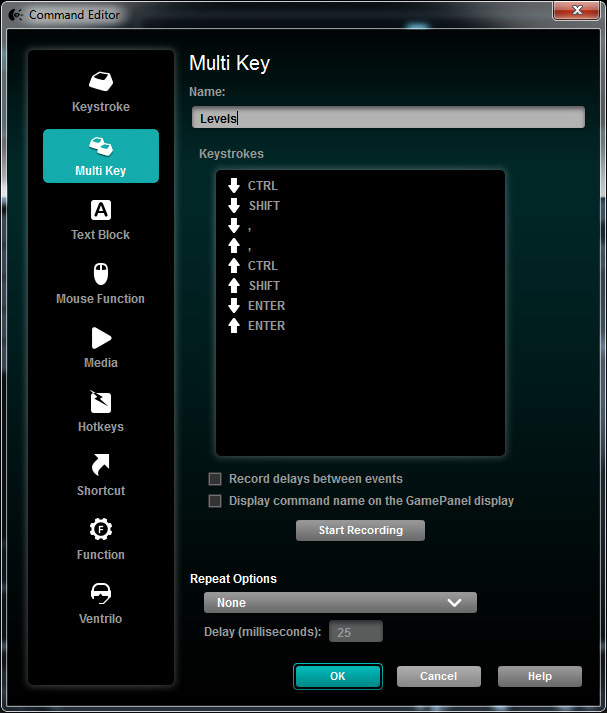 Mostly how to use the express keys (aka buttons), stylus and adjustment wheel. 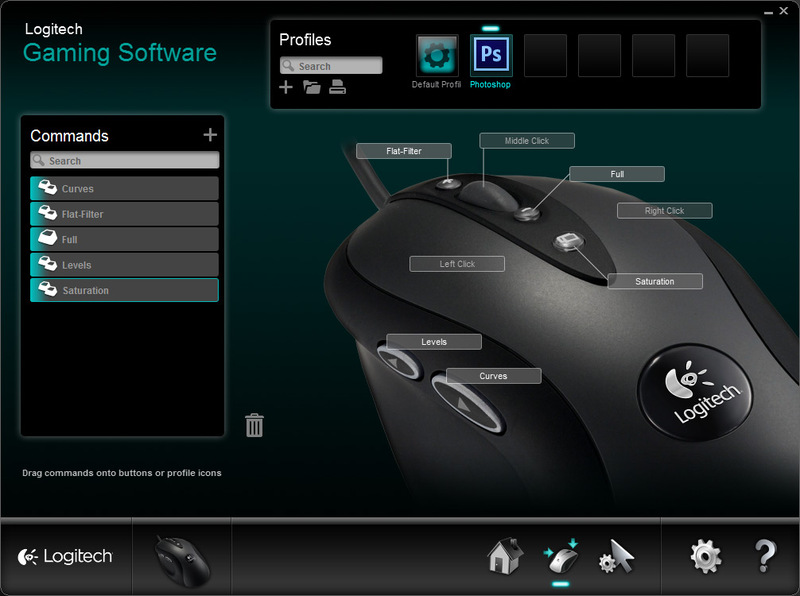 Have yet to use it properly on retouching but quite possibly this evening sometime. I’ll try to do an update post sometime. Thought I’d put together a table to compare the “small” tablets currently available in the UK. 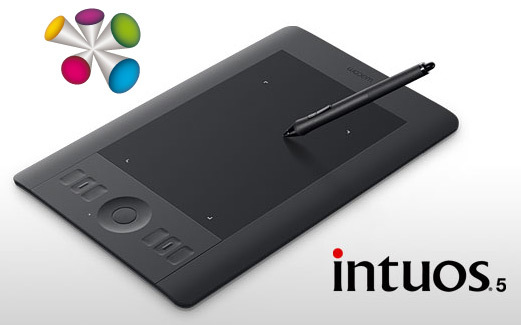 This is soon to change though as Wacom have replaced the existing Bamboo models with the Connect, Capture and Create models in the US – which I assume will be available in Europe in a bit. *Retouching : What I consider retouching is where you replace specific pixels or only part of the picture – such as cleaning up skin blemishes. For events I usually don’t do this – just lighten/darken/etc the picture as a whole. Usually refer to this as just “editing”. I don’t know if this is a universal definition – but it is mine.